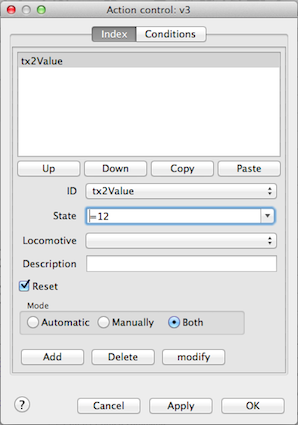 Every Rocrail object which can trigger actions can also modify variable values. The possible commands are listed in the Action Commands table. As many other objects in Rocrail variables can also trigger actions. The status field is used to check if the variable has a certain value. The possible operators are listed in the Status and Condition tabel. Variables can be compared with numbers, other variables and Text objects in conditions. This example only shows how to play with a variable and its actions. The definition of variable v3 is very simple and needs only a range, min/max, in which a random number should be generated. In this case between 5 and 15. 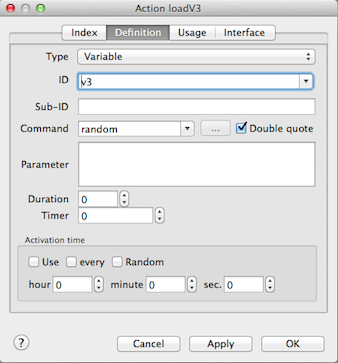 This action will load a random number in variable v3 regarding the min/max range. 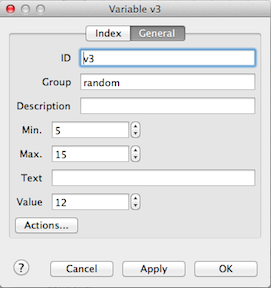 An action control defined for variable v3 which will be activated if v3 becomes the random value of 12. 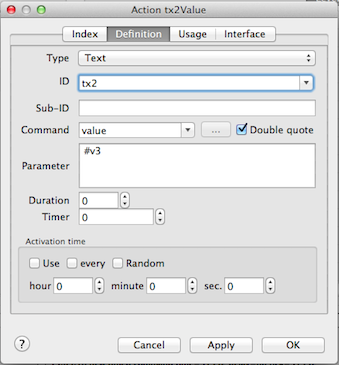 This action will show the value of variable v3 in text object tx2. Add the action defined in step B to for example a sensor object with status on.